The value I am receiving for my investment is very high.... CustomInsight has delivered on every request. Our 360 feedback software is trusted and used by more than half of the Fortune 100, as well as thousands of other companies worldwide. 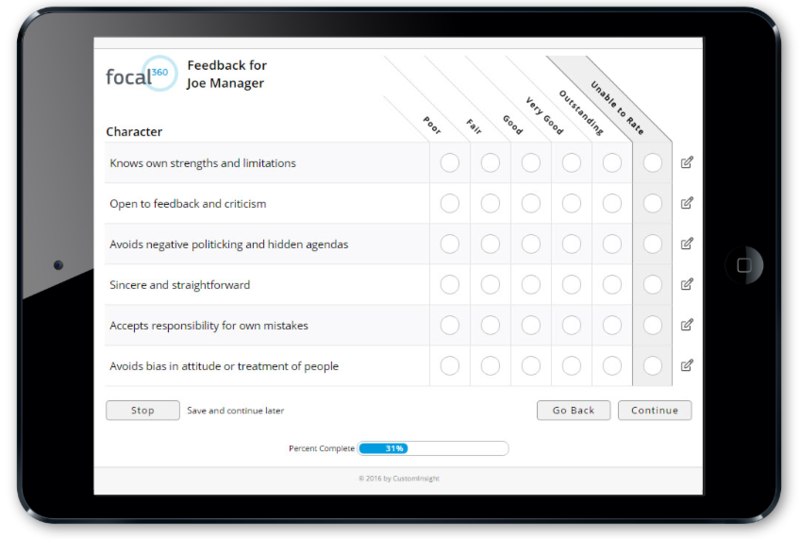 Focal 360 is an industry leading 360 degree feedback survey solution designed for groups or projects of any size. It is easy to use, effective, and highly customizable. Valuable insights and tools right at their fingertips. Online Reporting. In the interactive dashboard, employees can see their overall results at a glance, and easily drill into important details for a more complete picture. Expert Guidance. Insight & Advice help you better understand issues and take corrective action. Development Planning. After flagging survey items for action, you can make development plans with goals, tasks and due dates. Progress Monitoring. Get quick feedback on your development goals, and then on your progress. Pixel-perfect report design. Professional-looking reports add credibility to the results and make you look good. Clear, focused, and easy to understand. No PhD or special training is required to interpret the results. Customizable report content. You decide what to include in your reports. Group reports at no additional cost. Targeted qualitative feedback (different for every rater). Comments are often the most important part of the feedback process. 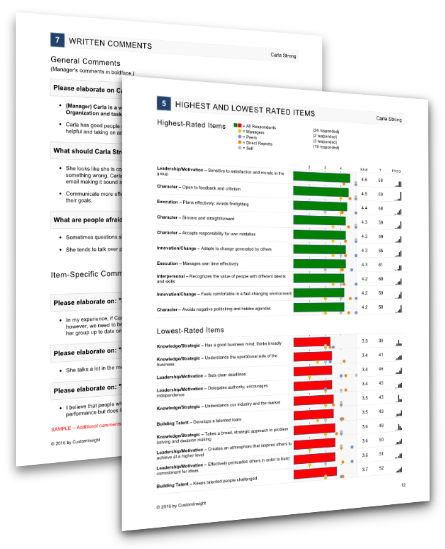 Raters are prompted to provide additional comments in the areas where participants most need them. In addition, raters can also provide comments for any item in the survey. Surveys are fast and easy to complete - typically 10 minutes or less. Automatic reminders are sent to raters with unfinished feedback tasks. Raters work from a task list that shows the status of all feedback requests. Intuitive admin interface. You will be amazed by how fast and easy it is to set up and manage the entire 360 feedback process. Fully automated 360 process. Once the feedback process is underway, there is nothing more you need to do. Complete control every step of the way. Monitor progress, send reminders, and make adjustments at any time. Flexible. Tailor the 360 process to your specific needs. We provide a complete library of benchmarked and validated competencies (optional, no added cost). Customizable categories & items. Use your own competency model and survey items if you prefer. Create multiple survey templates for different participants, groups, or projects. Use our 360 templates or create your own. Customizable question format & rating labels. You decide exactly how you want to get from point "A" to point "B". Rater selection process, communications and scheduling are all within your control. There are no limits when it comes to reporting options. Choose from dozens of different configurations that are provided as standard options, or let us build an entirely custom report from the ground up. Global Customer Service. Responsive customer service and unlimited technical support. Available in 25+ languages. Even more available upon request. White Labeling. Fully branded for consultants or for your company. Learn More. Hosted by us on dedicated servers in a highly secure and reliable datacenter - leave the IT worries to us! Ready to Learn How Focal 360 Can Help Your Business? 360 Degree Feedback is a process where employees receive feedback from their managers, peers, and direct reports. Employees also complete a self evaluation as part of the 360 feedback process. 360 Feedback is often used as part of a performance evaluation or performance appraisal process, but it is ideally used for developmental purposes only. Many companies try to use 360 Degree Feedback for both performance evaluations and development, but this is tricky since it sends a mixed message to employees. Nevertheless, this is often the practical reality that organizations face. 360 Feedback is most commonly used to get feedback on managers and leaders in an organization, but some companies also include non-managers (individual contributors) in the 360 feedback process. When 360 feedback is conducted at different levels, it usually makes sense to use different 360 survey templates for company leadership, managers, and non-managers. The competencies, behaviors, and skills that are needed at each level are different, so the 360 evaluation form should be designed to measure the things that that are relevant to each person's level. We have provided some sample 360 feedback survey questions for different levels so you can see how this typically works. When used as a development tool, 360 degree feedback offers a number of benefits, including increased self awareness, identification of potential problem areas and gaps in perception (blind spots, disagreements, hidden strengths and weaknesses, etc. ), professional development, and increased communication and openness among employees. Focal 360 is an online software system that allows you to conduct 360 degree feedback with minimal effort and maximum impact. The entire process is streamlined and automated. Process management requires very little effort. We offer pre-defined questionnaires and a general leadership model that is statistically validated and benchmarked. Alternatively, you can load your own survey template or competency model into our 360 software. Focal 360 is used by a broad range of companies and HR consultants, including more than half of the Fortune 100. We work with companies with just 10-20 employees, and we also support large-scale projects at large companies with more than 100,000 employees and tens of thousands of managers. Focal 360 can be customized according to your specific business requirements or talent management process. If you have a unique method, approach, or model for 360 feedback, let us know. Since Focal 360 is a web application, no special software or operating system is needed. The application is compatible with Windows or Mac, as well as other common operating systems. The only technical requirement is an internet connection and a web browser, such as Internet Explorer, Firefox, Safari, or Chrome. Please contact us if you would like to see an example of our reports or review our system. We are confident that you will be impressed by the ease of use and quality of the product.